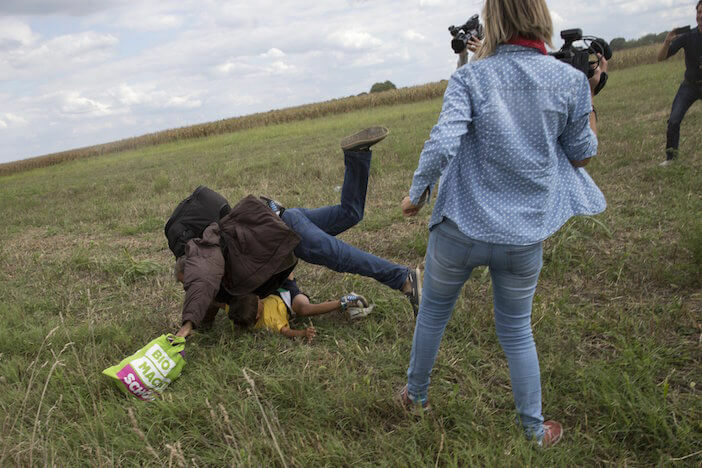 A camera woman has tripped and kicked refugees crossing a country border. There’s various photo and video evidence which has gone viral and public reaction is generally negative. Society is shocked, angry and horrified and the camera lady has now been sacked. Greek man, Misirlis had recently met the father and son in question and shared the story of their meeting via social media. Misirlis and the father and son crossed paths on their journey, where the father explained his travels which were lengthy and difficult. Misirlis was touched and troubled by their situation and gave the only thing he had to spare – a yellow Aris Greek football t-shirt. This t-shirt is the reason Misirlis identified the two on various media sources. The controversy of this story is the compassion and kindness of the Greek man, the shameful act of the camera woman, and the hardship of these emigrants.